Many Sikhs will name their baby on the fortieth day after birth in a simple child naming ceremony (Nam Karan). A prayer (Ardas) is recited. The Guru Granth Sahib is then opened at random and the first letter from the top of the left page is used as the first letter of the name of the child. Either the parents announce the name of the child immediately, or later after consulting other members of the family. A kirtan is held in which hymns are sung on behalf of the newborn. 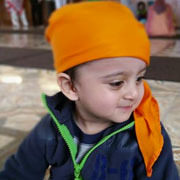 Sikh parents may choose a name without this ceremony, and yet others will get the paternal aunt or another close relative to choose, a process which may result in delay in registering the infant's name. 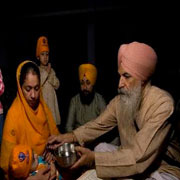 In order to lay stress on equality of human beings and rejection of caste system of the Hindus, all men and women who joined the Khalsa add the word Singh (meaning "lion") as suffix to their names, while the word Kaur (meaning "princess") forms the suffix in the girl's name for Sikh families. All Sikh names have a special religious meaning and some names may lead to gender confusion too which can be cleared if they use Singh or Kaur in the middle name. Known for their martial history and a fierce temperament, Sikhs take immense pride in their familial traits and their names reflect the history of their race. On the day of the Naam Karan, all the guests, relatives, the mother and baby take part in the kirtan of the Saad Sangat of the congregation. The family makes arrangements to have Karah Prasad said for the occasion. Various Shabads of thanks, joy and support are sung followed by the short Anand Sahib (6 pauris). Then if a Sahaj Paath has been arranged, the Bhog of this reading takes place.